Hallmark Movies & Mysteries will present a new premiere every Sunday night this June featuring an all-star lineup of four original mystery movies from favorite franchises "Garage Sale Mystery" starring Lori Loughlin, "Aurora Teagarden" starring Candace Cameron Bure, "Murder She Baked" starring Alison Sweeney and "Flower Shop Mystery" starring Brooke Shields. "Top-notch talent, masterful suspense and a hint of romance is the recipe for success at Hallmark Movies & Mysteries," said Michelle Vicary, Executive Vice President, Programming and Publicity, Crown Media Family Networks. "Our June slate has everything a mystery lover wants - intriguing cases to solve, genuine surprises and smart characters portrayed by today's most coveted stars." Jennifer Shannon (Loughlin) is a garage sale shopping expert whose sharp observation skills allow her to uncover valuable antiques, as well as help her local police department investigate crimes and solve mysteries. When an impoverished man enters Rags to Riches - a consignment shop where Jennifer sells the gems she's found at garage sales - and asks to have an item home-delivered, Jennifer agrees. Upon her arrival at his run-down apartment, Jennifer finds the man murdered. As the police survey the crime scene, Jennifer cannot help but think there is something familiar about the details of the killing - and soon realizes that the victim's cold-blooded demise is a re-enactment of a murder in a classic mystery novel. As Jennifer opens her investigation, a local life coach turns up dead - in a chilling re-creation of a murder from another mystery book. With a killer on the loose, Jennifer enlists the help of mystery author Terrence Duncan and college professor Myles Fowler, whose vast collective knowledge of crime literature serves as a useful resource. Before long, Professor Fowler emerges as a chief suspect. Just when Jennifer and the police think they've found the killer, Fowler is murdered - in a re-enactment of a homicide in yet another mystery novel. When Jennifer discovers connections between suspects and victims, and uncovers their ties to the literary world, she must race against time to solve the Novel Murders case, without becoming the killer's next victim. Aurora Teagarden (Bure) is a beautiful young librarian with a passion for solving murders. A member of The Real Murders Club, a group of crime buffs who meet to discuss notorious unsolved homicides, Aurora has a reputation as an expert crime sleuth in her small town. At an open house showing, Aurora meets Martin Bartell, a charismatic gentleman with a mysterious past, and happens upon the body of a local realtor who was strangled in the backyard. When the police arrive at the crime scene and open a homicide investigation, Aurora decides to launch an investigation of her own. Gathering clues and examining evidence, Aurora discovers that a valuable painting has been stolen from the open house. When a second realtor turns up murdered in another home for sale, Aurora compiles a list of suspects connected to the town's real estate scene, narrowing it down to those with an interest in the art world. As Martin becomes increasingly attracted to Aurora, mounting evidence has the police - and Aurora - looking at him as their main suspect. But, as her investigation unfolds, Aurora has other ideas. When her best friend, a local newspaper reporter, disappears, the librarian-turned-sleuth must race to rescue her from danger, solve the crime and bring the real killer to justice. And she just might find romance along the way. 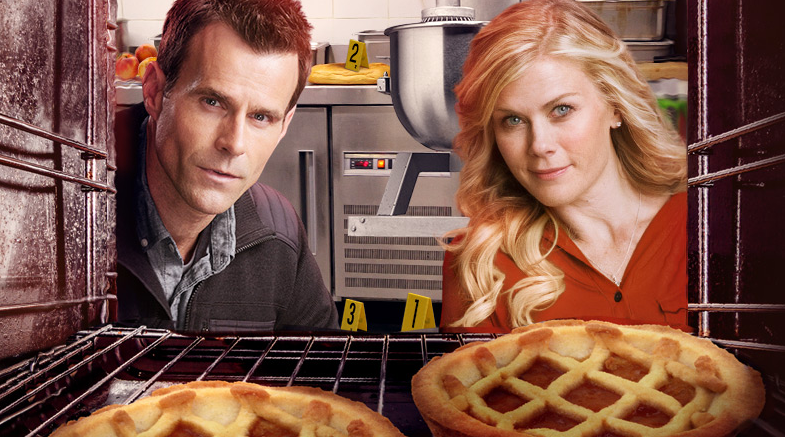 Bakery owner Hannah Swensen (Sweeney) just can't keep her hands out of the batter when murder stirs things up in Lake Eden, Minnesota, leaving the sheriff dead, a deputy accused, and a killer on the loose. For Hannah, life seems to be lacking a certain flavor lately. Maybe it's the local sheriff's election that's got her down. For years, Sheriff Grant's been the iron hand in town. But now, Hannah's brother-in-law Bill is giving the old blowhard the fight of his long, dubious career - and Grant's not taking it well, especially once the polls show Bill pulling ahead. But before anyone can taste victory, things go sour. While Hannah's emptying the trash, she makes a very unappetizing discovery: Sheriff Grant's body in the Dumpster behind the high school where she's teaching her cooking class. And as if that weren't bad enough, the poor man still has fudge frosting on his shirt from one of her cupcakes. The number one - and only - suspect is Bill, but Hannah's not swallowing it. Plenty of people had reason to hate Sheriff Grant. Soon, Hannah's dishing up scandalous secrets, steaming hot betrayals, and enough intrigue to keep the gossip mill at The Cookie Jar going through several pots of decaf. And the closer Hannah gets to the truth, the closer she gets to finding the murderer with a calorie-laden, nasty recipe for silencing people. Abby Knight (Shields) is a beautiful ex-attorney and proprietor of Bloomers, a quaint Illinois flower shop. As a bridesmaid and the floral arranger at her impulsive cousin's wedding, Abby hopes Jillian won't once again run from the altar. When the ceremony concludes without a hitch, Abby breathes a sigh of relief. But things take a mysterious turn when Abby and Marco (Elliott), a handsome bar owner and former private investigator, discover the body of Jack Sutcliff, an unscrupulous grifter who attempted to crash the wedding. While the police tape off the crime scene and a coroner examines the body, Abby's curiosity gets the better of her and she sets out to conduct her own murder investigation and solve the case. With Marco's help, Abby assembles an eclectic list of murder suspects - including her "black sheep" relatives, various wedding party members and even the groom's socialite mother - and uncovers the surprising ways they were connected to the victim. As Abby interrogates the suspects, a budding romance develops between herself and Marco. While Abby's investigation unfolds, one of the murder suspects turns up dead from an apparent suicide. But when Abby suspects this death was a homicide - and closes in on the killer - she finds herself trapped in a dangerous showdown. Now the former-lawyer-flower-shop-owner-turned-sleuth must scramble to bring the killer to justice, without becoming another victim.